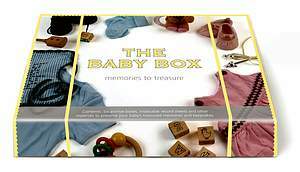 Welcome to the Baby Box, part of the Memories and Nostalgia collection, dedicated to helping you keep all your family’s cherished memories safe for generations . In every loving family, the birth of a baby is a time of delight and discovery. And yet, no sooner has your beautiful baby arrived than you’ll be busy, attending to his or her every need. At this time, it’s all too easy to lose track of precious memories and mementoes of baby’s early life and yet, years down the line, nothing will give more pleasure than to look back and remember. Designed to help capture the joy of the journey from pregnancy right through baby’s first years, the Baby Box will hold on as tightly to your memories as baby’s tiny fingers clasp your own. Most importantly, the Baby Box will keep your mementoes in perfect condition for many generations to come. Everyone has a favourite memento of happy days, which is why The Baby Box has been designed to involve the whole family in this time of excitement and optimism. It will help you keep messages and gifts from loved ones as well as written details of baby’s birth, impressions of early days and hopes for the future. Will baby’s birth day be announced in the newspaper? Then keep a copy, in perfect condition. Will you want to keep baby’s hospital tag, a soft wisp of hair, a print of a tiny foot or hand, baby’s first bootees? From congratulations cards to first toys and teddies,, this extensive collection of boxes, cards, record and family history sheets, tissue paper, photo frames and other materials will preserve and protect precious memories and keepsakes…long beyond the time when your baby’s babies have children of their own. See also our Baby Footprints page for free downloads. * These Archive Storage Boxes meet international standards: ISO 9706: 1994 (Paper for Documents – Requirements for Permanence); ISO 14523: 1999 (Photographic Activity Test for enclosure materials) or Technical Association of the Pulp and Paper Industry T509 and T529 (surface pH measurement of paper).